If you want to experience how you can better assess a certain situation or theme, the cross is the right spread for you. You can also use it to better illuminate the details of other spreads. This method uses 4 cards. The first card shows you what it's all about. It describes the starting position. As first card you drew "3 of Swords". The main meaning of this tarot card is: A message causes heartbreak. An inner conflict. The mind triumphs over feeling.. It generally means: Disillusionment, heartache and absence. 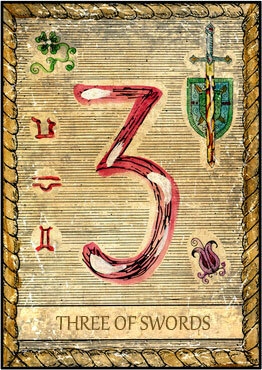 The card "3 of Swords" also stands for: Delay, breakdown, separation of a lover. Reversed it points to: Alienation, failure, loss, distraction, disorder, confusion. Meeting with someone who has threatened the questioner. What should you avoid, what is the wrong way? This tells you the second card. Pay close attention to the different statements of the second and third card. You drew "Page of Wands" as second card. The main meaning of this tarot card is: Take an exciting opportunity. Invitation to make something. Cheap testimony. A dangerous rival.. It generally means: Curiosity, proposition. 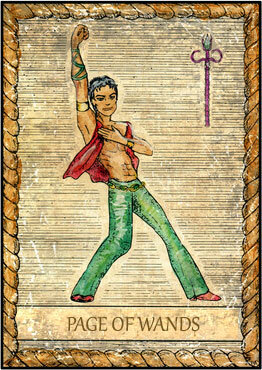 The card "Page of Wands" also stands for: Dark, young man, loyal, a lover, a messenger, a messenger. Reversed it points to: Announcements, bad news, indecision, instability. The third card will take you in the right direction. It will show you what you can do and how the Tarot's advice is. It may also happen that these advice is rather unpleasant. You drew "The Emperor" as third card. The main meaning of this tarot card is: Things becoming stable. You gain control. You can get through. A great person.. It generally means: Strength, power and realization. 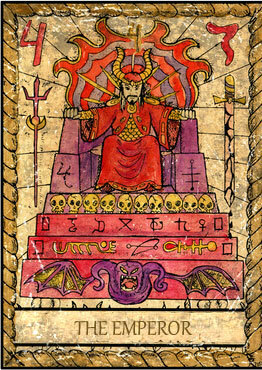 The card "The Emperor" also stands for: Implementation, will, stability, reason, achievement, help, authority and protection. Reversed it points to: Benevolence, compassion, confusion, enemies, disability and immaturity. The fourth card shows you the solution and how to get there. Your fourth card is "9 of Pentacles". The main meaning of this tarot card is: Seize a favorable moment. Action at the right time. Luck and trust. Good omen.. It generally means: Success, favorable moment and power. 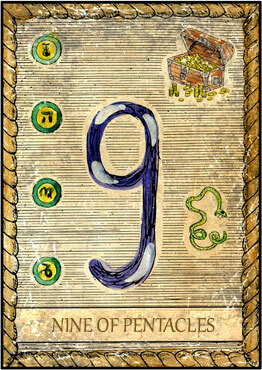 The card "9 of Pentacles" also stands for: Security, intelligence, realization. Good business and hopes. Immediate confirmation of what neighboring cards indicate. Reversed it points to: Trickery, deceit, unsuccessful project, malice, futility. Since the fourth card already shows a way, no quintessence cards are needed here.